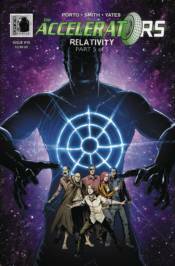 Futures collide as the Relativity arc reaches its deadly conclusion! Spatz comes face to face with his older self, who reveals the true extent of his time-travel powers� and his insanity. This enemy seems unstoppable: he knows everything, can't be reasoned with, and will kill to get what he wants. Can anyone survive?